As you requested with your variable amount flexible recurring wire instructions, we process a wire transfer to Laird Technologies every day. You have asked us to continue sending wires until notified. If you want to stop sending wires, please login https://businessaccess.citibank.citigroup.com/cbusol/signon.do and make changes, or you may contact us by Secure Email. How can the public tell what consumer site is trustworthy or to file a complaint? That’s a lingering fear online. These guys have run out of so called big ideas and have now turned on each others. They can no longer post bogus employment ads on Monster.com or careerbuilder.com for get rich schemes or the work at home schemes. They are now Consumer Advocates. Can you believe this? Who Is Who? From what we know, they are all the same. Complaintsboard.com is accusing scamfound.org of operating Consumer Online Protection. They claimed to be hosted overseas or from Lativia, Russia or Timbuktu or from some alien planet. The good thing about these fights is that they identify each other or at least put out some truthful information about each that one can build on. 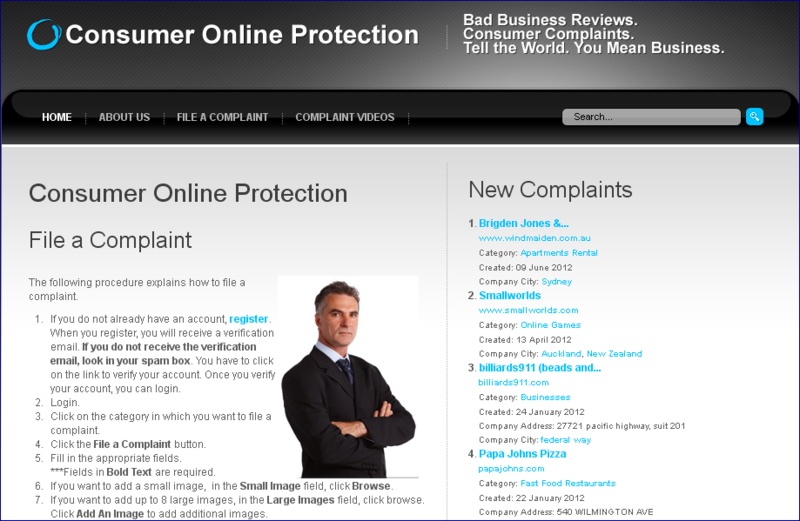 According to Complaintsboard.com, Consumer Online Protection site owner is Scott Breitenstein. They shake down individuals and businesses for thousands; peddling attorneys and the court system who are often in league with them they have fun doing Extortion to others. Consumer Online Protection is a big joke. site owner, Scott Breitenstein is a pig. You say this is a not for profit website but someone is getting something out of it!!! How in the world can you get away with allowing slander!!! people who run it think they are above the law. However, there is nobody that is above the law and I will do everything in power to see that this ridiculous website is shut down!! god is watching them all. It is apparent that this Scott Breitenstein may have exposed Complaintsboard.com operations. We know that most complaints posted on Complaintsboard.com are manufactured by paid commercial posters operating out of India. Ed Magedson of Ripoffreport weigh in on this insanity………. The Internet community is fighting back, as are courts AROUND THE WORLD, but more and more people are getting scammed every day. These criminals outright COPY AND STEAL reports directly from ripoffreport.com, and post them on their own websites. Some of them THEN contact the owners of companies mentioned and blackmail them into paying saying they’ll take DOWN ALL REPORTS. So why should you care? At a very basic level, it may appear that consumer complaints should get as much exposure as possible. And we don’t disagree with that. But consumers choose Ripoff Report as their forum because we have a 14-year track record of protecting the consumer. We don’t take down posts for money, we don’t cower to bullies who threaten or file lawsuits and we do offer the Ripoff Report Arbitration program to address false statements and the Corporate Advocacy Program to help businesses improve their customer service. FACT—Russian criminals are stealing reports from www.RipoffReport.com and then using them to extort money from victims in the United States. Their game works like this: 1.) they begin by stealing thousands of pages of reports and other original content from www.RipoffReport.com (they sometimes even copy our Terms of Service! ); 2.) they extort money from business owner by demanding money to remove the reports. These sites don’t care anything about helping consumers; they only care about one thing—money. The worst violator is www.Scaminformer.com. This site was created in January 2011, and when it first went online, the site contained literally tens of thousands of pages of content illegally copied from www.RipoffReport.com. In fact, not only did the site steal massive amounts of content from us, they even removed our copyright ownership information (which is a violation of federal law) and they also backdated every posting by 24 hours in an attempt to make it look like the material was originally posted on their site. Ripoff Report immediately filed a federal lawsuit against www.Scaminformer.com. You can read a copy of our Original Complaint here. Because www.Scaminformer.com isn’t a legitimate site, they failed to appear in court and we were awarded a $100,000 judgment against them. Furthermore, the federal court issued an injunction requiring them to remove all of the material they had stolen, and to immediately stop copying material from www.RipoffReport.com. You can read a copy of the Judgment and Injunction here. Unfortunately, after the judgment and injunction was entered, rather than stopping its criminal conduct, www.Scaminformer.com did exactly what all scammers do—they simply transferred the site to a new owner—Eugene Selihov (also located in Russia) who now claims that he’s not stealing content from Ripoff Report and he has no idea how thousands and thousands of pages of new reports copied from www.RipoffReport.com have appeared on his website. You can read our Amended Complaint against www.Scaminformer.com’s “new” owner Eugene Selihov here. Sadly, this is not the only instance of other websites stealing content from Ripoff Report. Another serious/repeat violator is www.ComplaintsBoard.com. We sued that site in 2008 for stealing huge amounts of material from the Ripoff Report. You can read our Original Complaint here. We determined that the owner of www.ComplaintsBoard.com was actually located in eastern Europe, but they didn’t bother to show up in court. As a result, we were awarded a $60,000 default judgment and permanent injunction. We were later awarded an even larger amount for legal fees and collection expenses. But once again, this didn’t stop the criminals from continuing to unlawfully copy material from our site; they simply transferred ownership to a new company so they could try to argue that our injunction doesn’t apply to them. As such, we recently filed another lawsuit against the new owner of www.ComplaintsBoard.com, and you can read a copy this new lawsuit here. REMEMBER: Ripoff Report cares about one thing—helping consumers! Our competitors don’t care about that….they only care about TAKING MONEY from victims so they can HIDE REPORTS (reports which they probably stole from Ripoff Report in the first place). Keep that in mind next time you’re thinking about posting a complaint on any site other than www.RipoffReport.com.